On August 23, 2013, Sean Boushie met with Officer E. Smith at the Missoula Police Department and told him that Bill Windsor called him so many times that he had to disconnect his telephone. This false police statement is evidence that caused Bill Windsor to be standing trial for five alleged crimes. “He's had to disconnect his home phone (land line) due to the calls Mr. Windsor has made, and now he only has a cell phone." This is absolutely false. Bill Windsor has never called Sean Boushie EVER. Not once. This never happened, and there is no evidence that it did. 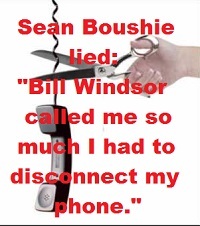 Bill Windsor has never called Sean B**shie at any time. Never happened. This is a complete fabrication. Sean B**shie made no complaint to the police prior to this. There are no records of 911 calls. Bill Windsor invites the Missoula Police Department to check his telephone records with Verizon -- 770-578-1094. 2. Review Bill Windsor's telephone records. 3. Find out what Sean B**shie's land line number was, and find out when it was disconnected.